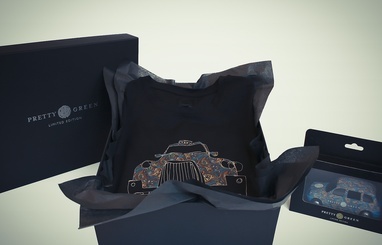 LONDON - To celebrate the opening of the first Pretty Green retail store on London's Carnaby Street, a traditional taxi was adorned in the iconic custom paisley design. This taxi has been faithfully reproduced as a 1:36th scale Corgi model. This limited edition run of just 1,000 individually numbered pieces comes in a specially designed Corgi collectors box. To accompany the model, illustrator David Tazzyman was commissioned to design an accompanying t-shirt. This has been printed in 12 colours on a Black Label, 100% Egyptian Cotton Tee. Click here for other photos.